Drama about what it means to be black—or white—in the U.S.
Rokia Shearin and Marija Juliette Abney in Chokehold. Photo by Albert Bonilla. BOTTOM LINE: Chokehold sheds light on what it means to be an American when all trust in justice—and each other—has been shattered. From the beginning of Anthony P. Pennino’s socially topical Chokehold, the Justice Now Front is seeking exactly what their name implies. The front, composed of four black members and one white radical, has just kidnapped the most stereotypically white male they could find, Devon Cartwright (David Gow). They bring him to their warehouse, the spacious black box itself being transformed into this hideout. Carter (Thomaz Mussnich), the white radical of the group, frames Devon up on his cheap camcorder, which has been hooked up to a television onstage. Two members of the group, Jason (Roland Lane) and Andre (Michael Oloyede), are dressed in SWAT team uniforms and rough Devon up, forcing him to strip down to his underpants. They criticize every garment and possession that Devon was forced to discard—an Abercrombie and Fitch lavender button-down, Brooks Brothers khakis, an iPhone 4s, and a beat-up wallet containing three measly dollars, a worn debit card, and a card for the Duane Reade savings club. The five are openly unimpressed by Devon’s lack of flashiness but are relentless with him still. Devon quickly voices the question lingering among the audience: “What have I done wrong?” They proudly read his charges of exercising, walking, grocery shopping, and anything else the average human would do in a day, all while being "excessively white." His crimes are deemed punishable by certain death, and Devon is going to face the same due process that his black brothers and sisters have faced: none. As Devon, fearing for his life, pleads that he hasn’t done anything, the Justice Now Front’s perspective becomes clear—he hasn’t done anything for better or for worse. True, he is neither a racist nor an active component against Black Lives Matter; however, he’s never really done anything to help, always taking the perspective of it not being his duty. In this way, Devon represents the average, insulated white American, the white American who accidentally trumps “black lives matter” with “no, all lives matter,” a truly cringe-worthy mistake. However, the ignorance displayed by Devon is brutally honest in its portrayal of white America, crossing Walter Scott with Eric Garner, and Missouri with Maryland. Although this ensemble of six incredibly talented actors immediately creates a world of high-stakes tension, the piece is rife with comedy. As Devon is about to be killed by the faux-SWAT team, Andre and Jason look at each other, and confess that neither of them have killed anyone, and don’t really feel “comfortable.” Andre also used to be Devon’s RA at Bard, and they exchange college pleasantries throughout the show. This comedy does not just provide necessary pockets of relief, though, as they are expertly planted throughout Pennino’s writing to provide gateways into what makes each and every character onstage vulnerable. As the naked Devon sits in his chair mid-panic attack, the radicals domino into a series of monologues, each character divulging into their personal story, and moreover what it means to be African American right now. In a show-stopping moment, Tika (Marija Juliette Abney) uses movement to weave the female history—or herstory—that has all boiled down to the creation of the strong woman that she is. When she finishes, several members of the Justice Now Front are quietly crying, and it seems that they have all released their anger; even Dominique (Rokia Shearin, an undeniable standout of the ensemble), their leader, finds it impossible to carry through in killing Devon. Chokehold is packed with twists and breathtaking moments as the story continues, but overall provides a refreshing, honest look at a conversation ongoing since the summer of 2014: “How do we cause change, and, more specifically, who is the we responsible for sparking change?” Even with a black president and secretary of Homeland Security, the answers do not come. 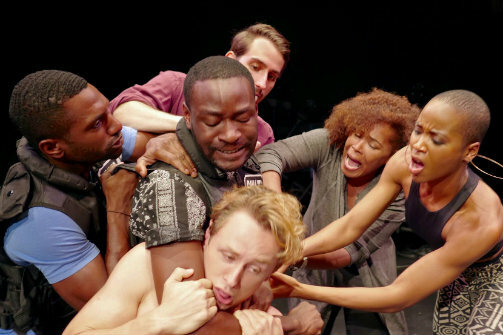 Chokehold packs just enough of this topical punch with nuanced character backstories and delicious moments of comedy to leave the audience feeling not overwhelmed, but determined to get down to business. Chokehold is by Anthony P. Pennino. Directed by Tim Cusack. Assistant Director is Narada Campbell. Stage Manager is Edwina Morales. Costume Design by Candace Lawrence. Lighting Design by Kryssy Wright. The cast is Marija Juliette Abney, David Gow, Roland Lane, Thomaz Mussnich, Michael Oloyede, and Rokia Shearin.